This photo was submitted by Kevin Travis. It was taken with a Nikon D90, ISO 200, f/22, 1/4 sec. Processed with Adobe Photoshop 7 and Lightroom 3.2. At first glance this photo has great impact; the WOW factor is huge. It has a simple, clean composition and the color is nice. The image looks sharply focused and shows a wide range of tones. Overall, it’s a very well captured and minimally processed image. The first thing my eye goes to is the cloud streak; my eye sweeps down and to the left. The eye movement stops at the cluster of dark trees. And looking closer at the composition, all the lines seem to point to the dark bunch of trees. This creates a strong focal point for the image. But what’s the subject? It this a picture of an old barn, is it a picture of clouds, is it a picture of trees? Looking at the photo longer, things start to come apart, quite literally. There’s a lack of cohesion between the graphic elements in the frame. First and most important is the bright streak of clouds. It attracts a lot of attention and subdivides the frame. The line created by the bright clouds creates a directional pointer to the dark circle of trees. Your eye travels down the line of clouds, ends up at the trees, and there’s no visual reward to be found there. The old barn becomes irrelevant. The left side of the picture is distinctly separate from the right side; it’s two separate pictures mashed together in one frame. The left side of the image doesn’t add much to the composition; I’d suggest cropping in from the left. Bringing the graphic elements of the composition together would have helped the picture a lot. On location, I would have recommended moving to the right so that the roof of the building overlapped the clouds a bit. The trees on the right edge of the frame are distracting, too, because they’re in a bright area of high contrast. Your eye gets sucked into that bright spot and again, there’s no payoff. Overall, the composition looks “crooked”. There’s a horizontal line that goes all the way across the frame and it looks slightly tilted counter-clockwise. In all photographs you need to pay attention to how the graphic elements in the frame interact with one another. Although you need to maintain visual separation between elements and avoid mergers, in this case the picture would have been stronger if some of the parts weren’t so separated. Finally, I’d recommend burning the bottom of the picture to add visual weight, help ground the composition and hold the eye in the frame. You can do this in Lightroom with the graduated filter tool. Thank you for submitting your photo, Kevin! 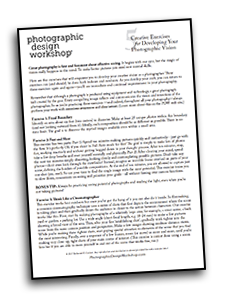 I hope you find this critique helpful when making future photos. First let me say thank you for taking your time to critique the image I submitted. I was hoping to get a professional unbiased opinion and I certainly feel you delivered. I’m relatively new to DSLR cameras (April 2010), Lightroom 3.2 (two weeks) and Photoshop 7 (two months). I’ve read the critique probably 10 or 12 times, breaking it down line by line and trying to digest your point of view. I whole heartedly agree with your conclusion. Taking a hard look at the image (from your stance), I now understand how all “lines” point to the trees in the lower left corner which takes away from the overall photo. The sky almost creates a funnel straight to the tree line, which is not what I wanted the image to convey. 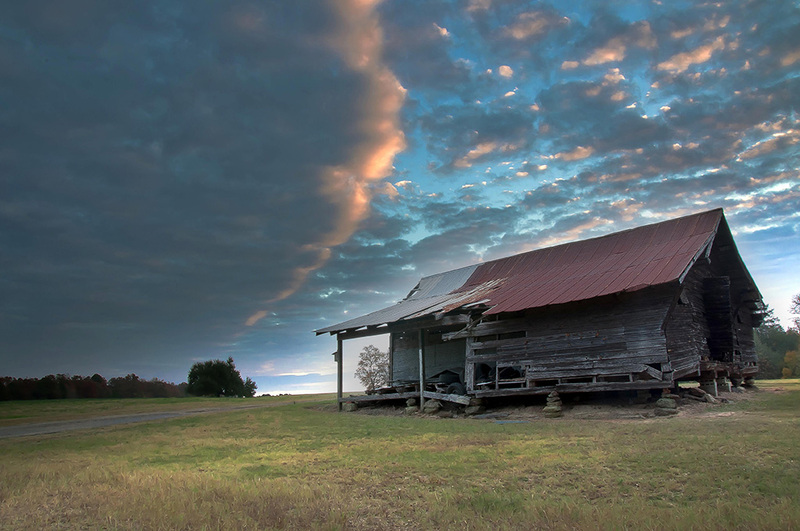 The image was suppose to be about the barn with a beautiful sweeping sky. Cropping the left side may work, but I honestly think you hit the nail on the head when you recommended “moving to the right so that the roof of the building overlapped the clouds a bit”. I believe that would have made all the difference in the world. The barn sits on a rolling hill and one end of the barn sits a little higher than the other end. This may have caused the “crooked” appearance, along with the fact that I incorrectly composed the shot. Either way, I’m learning. I read anything I can pertaining to photography daily, not to mention practicing with the camera daily as well. It’s been a learning curve, but one that I’ve truly enjoyed. You gave me kudos on tone, impact and color, that tells me that I’m making progress. I do have one question. You mentioned burning the lower part of the image to add visual weight and help hold the eye to the frame. Are you saying that I should darken the grass and change the actual color? I tried to capture what I actually saw and not manipulate the image, color or tone. I understand this can be controversial. I made the changes to the old barn image that you suggested. It looks better taking out the distant trees, burning the fore ground and adding a little bit of vignetting. I’ve found a few articles on composition, which by the way is limited, and it’s becoming a little bit clear now. It’s funny how all the books and magazine articles I’ve read dealing with photography seem to overlook composition. Can you recommend any good books or articles that deal with this subject? Thanks again for all the help. You can check out my flickr page at your convenience to see how things are developing. Kevin, thanks for your reply and for commenting after you’d done more work on the photo. However I didn’t see a reworked version on the Flickr page; am I missing something? s books (The Photographer’s Eye and the Photographer’s Mind are especially good).